Stinky or leaking cloth diapers? It may be time for a strip! RLR works wonders for those who have hard water. It gets all the extra detergent and build up OUT of your cloth diapers!! RLR is very simple to use and can make a big difference. RLR was originally developed as a once a month treatment that can be used on all washable fabrics, both for whites & colors. 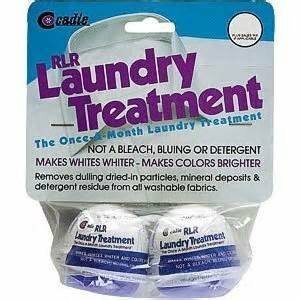 RLR Laundry Treatment is NOT a soap or bleach. It is a special treatment to remove dulling dried in particles from fabric. It leaves your white clothes whiter and your colored clothing brighter. During regular washing, mineral deposits in the water; dirt and soil sediments; and residual matter from detergent all accumulate in the fabric causing it to look dingy. RLR Laundry Treatment works by removing these particles from the clothing and cloth diapers, and holding them in suspension in the water. This prevents them being redeposited so they can rinse away leaving fabric looking like new. Use one package for each 18 - 24 cloth diapers you would like to strip. Fill your washer or tub with water and 1 packet of RLR, then put your clean diapers in the water. Let the diapers soak for a few hours, allowing the RLR to do it's job. No detergent is neccessary. After a few hours run a full wash/rinse with no detergent. Continue to run rinse cycles until the majority of bubbles are not observed in the washer. Dry as usual. For major buildup, you may need to do more than one RLR strip back to back. Open package and empty directly on dry or wet laundry in washing machine. Wash as usual with detergent. RLR Laundry Treatment can also be used for handwashing of one or two small pieces of clothing--just use a small amount in a basin of water. The amount of RLR added is the same in a front loader or a top loading washing machine. 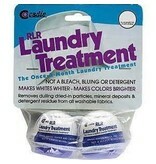 RLR Laundry Treatment contains no phosphates, is bio-degradable and non-polluting. Available in 1.35 oz pouch (1 treatment) or 2 treatment pod pack.